As the leading installer of vinyl shade structures in the DFW area, we often get questions from customers about what sets our products apart. Some of the most popular products we offer are vinyl pergolas. To help you understand why vinyl is the best choice for shade structures in your backyard, we’ve put together some answers to many of the common questions we hear. A pergola is a shade structure similar to an arbor, but larger and more versatile. Pergolas are popular as yard and garden structures, especially for forming seating or entertaining areas. The most distinctive features of a pergola are its open roof and tall vertical columns, which create a space that is visually appealing and noticeable. Pergolas are an excellent choice for anyone looking for a shade structure that feels “unified” with its surroundings. Why Vinyl? What Makes Vinyl Pergolas Better? If you’re considering a pergola for your home, you have many materials to choose from including wood, vinyl, and aluminum. However, only vinyl offers the benefit of high strength and durability without compromising on appearance. A vinyl pergola is strong enough to last through a lifetime of use, and its appearance will never degrade or decay. Vinyl pergolas are also easy to maintain. Unlike wood, vinyl pergolas don’t need to be painted or stained, and they also won’t rust or corrode like metal pergolas will. In fact, vinyl pergolas are virtually maintenance-free, making them the best choice for anyone who wants a shade structure without tons of upkeep. Can Vinyl Pergolas be Customized? We’re often asked if we can supply custom vinyl pergolas – to which the answer is, “Of course!” We specialize in creating custom vinyl structures to suit your exact needs and desires. Whether you want a pergola that matches the look of your home, a structure sized to fit a particular area, or any other type of customization we can work with you to make your view a reality. Can A Pergola Be Attached to a House? Another common question is whether a pergola can be attached to a house to form a patio cover, archway, or other built-in structure. In general we are able to attach vinyl pergolas to your home, but you should know the permit process can change for attached pergolas versus free-standing ones. Do Pergolas Provide Shelter from Rain and Weather? Pergolas are excellent at providing shade, but because their roofs are open they don’t provide any protection from rain or other precipitation. However, there are options available to give your pergola a protective roof. Some homeowners use polycarbonate sheeting or clear plastic, for instance, to provide more protection from the elements. If you want a structure with a full roof built in, you can also choose from some of our other vinyl shade structures such as cabanas and patio covers. These structures can even be built with full walls to provide a comfortable outdoor room that is fully sheltered from the elements. Vinyl pergolas are extremely strong and durable, but they don’t stand on their own. The strength of a pergola depends in large part on how it it secured to the ground. Because every person’s needs are different, we offer several different anchoring solutions to fit your situation. This can include cementing the posts into the ground, securing them to concrete pads with brackets and bolts, or using rebar or auger-style anchors to secure it over soil. At Future Outdoors we prefer to install posts 3 feet in the ground with concrete, or we can attach the posts to your existing concrete patio. How we attach the posts will depend on your situation. How Many Posts Will My Pergola Have? The shape of the pergola. At Future Outdoors we use steel beams and rafters to give your pergola a substantial and durable structure. We will then consider the above factors to place posts where they are needed for maximum support, but our designers and specialists will work with you to ensure they are placed appropriately for your needs and goals. Many people wrongly assume that vinyl pergolas will fade or turn chalky over time. While this may have been true with early vinyl structures, today’s vinyl pergolas are much more durable. Our vinyl is made with a high quantity of UV inhibitors which prevent fading and chalking. Plus, we only use 100% virgin vinyl so you can be sure your pergola is built with quality materials. Can I Add Anything to My Pergola? Many customers make custom additions or changes to their pergolas to suit their needs. For example, we often run wire and supports for ceiling fans in pergolas, which increases their utility as an outdoor room. Other common additions include additional supports for a porch swing or plumbing for a plant misting system, and we can always work with you in the design stages to help you get exactly what you want as well. What is the Warranty on a Vinyl Pergola? All of our vinyl products, including vinyl pergolas, carry a lifetime warranty on materials. If you want to learn more about our warranty or learn exactly what is covered under it, feel free to give us a call at 972-576-1600 today. Getting a vinyl pergola is as easy as picking up the phone and calling our office. One of our specialists will schedule a free, no-obligation meeting to come to your property and talk over your goals and ideas, then give you an estimate based on your discussion. From there you simply place your order and our installers will bring it to your home and set it up once fabrication is complete. Wait times depend on demand and the season, but actual installations are usually complete in a day. 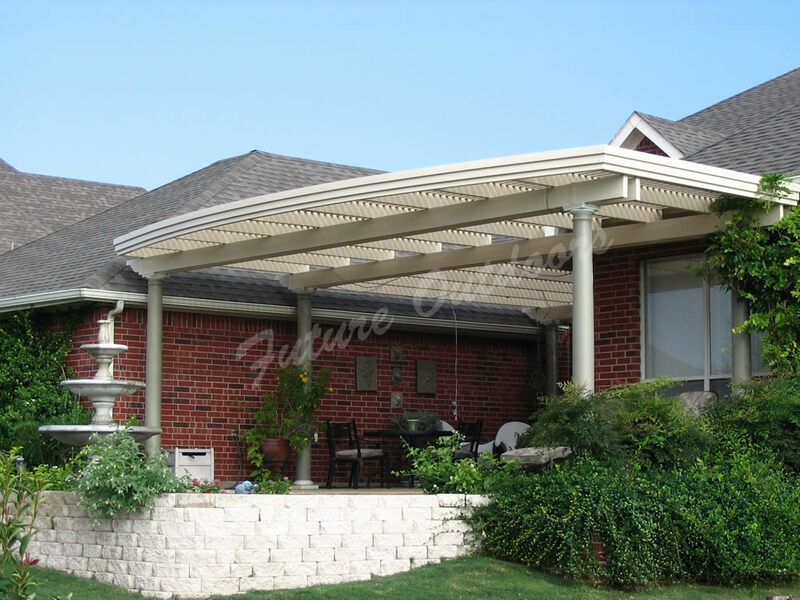 If you want to complete your patio, yard or garden with a high-quality shade structure, you owe it to yourself to consider a vinyl pergola from Future Outdoors. We’re the leading installer of vinyl shade structures in the Dallas metro, and we would love to help you with your project. Call 972-576-1600 today or visit our Facebook page to learn more about our products and services.